Noting that the US support a resolution of the Grameen Bank issue, a top Obama Administration official has said that America is not interfering in the internal affairs of Bangladesh. "I don't want to make it sound like we're interfering too much," Assistant Secretary of State for South and Central Asia Robert Blake said in an interview to The Financial Times. "We have made it known that we support a resolution of the situation to preserve the integrity and the independence and the effectiveness of Grameen Bank, but we have not sought to try to prescribe what that solution should be," he said. "It's really up to the government of Bangladesh and Grameen to work that out and we hope they can do so in an amicable and mutually acceptable manner," Blake said. 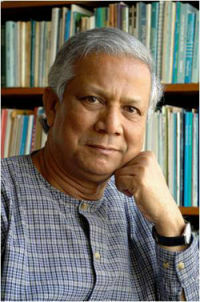 Nobel laureate Muhammad Yunus enjoys great respect in the US for all of his work to help the poor in Bangladesh. "I think NGOs like Grameen Bank and BRAC, really have global influence and their activities have really brought great credit to Bangladesh's reputation. President Obama awarded Mohammed Yunus the Medal of Freedom in 2009," he said. "The US Congress voted him a Congressional Gold Medal in 2010. So he enjoys really quite strong respect. We've heard from many Members of Congress and other friends here about their concerns of what has been happening to Yunus. We ourselves have had similar concerns, and that's why I think we've been engaged," Blake said. Stating that the US is troubled with the developments in Bangladesh on this issue, Blake said: "Despite a great many conversations that we have had at all levels of our government with our friends in Bangladesh, I think there's been deterioration in the situation. "We're troubled particularly by this most recent decision in which Yunus was removed from his position as Managing Director of Grameen Bank." A transcript of the interview was released by the State Department. Blake said Bangladesh is a moderate secular democracy that has a vibrant civil society and a history of religious and ethnic tolerance. "They are a partner of ours on many of President Obama's most important signature initiatives like food security, climate change, global health, and counter- terrorism. "They're also a country that has really made quite important progress to reduce poverty and inequality," he said. Blake said Bangladesh is a country that's doing a lot of things right and a lot of things well. "Some of their recent actions with respect to Grameen Bank are a little bit out of step with that, so we just felt as a friend that it was important to point that out and express our interest in seeing an amicable resolution of this," he said.